XYZprinting is showing off two new 3D printers at the IFA 2014 expo in Berlin. 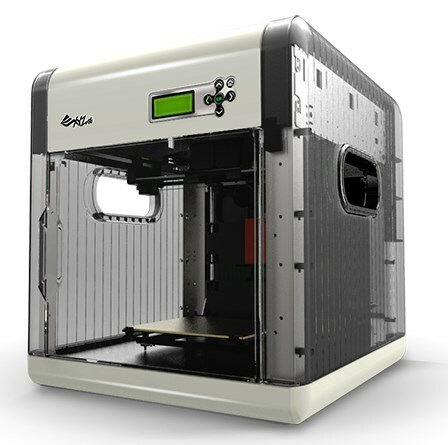 First up is the da Vinci 1.0, a personal 3D printer with a MSRP of 599EUR. Designed for regular consumers and small businesses, this 3D printer is shipped completely plug-and-play and doesn't require you to put it together. XYZprinting claims the da Vinci 1.0 printer is not ony one of the most affordable 3D printers on the market but also offers a larger maximum print volume (200mm x 200mm x 200mm) than any other 3D printer in its price class. da Vinci 1.0 uses ABS as its filament material, the base material is sold in 12 colors but you can only print one color at a time. Perhaps more interesting is the da Vinci 1.0 All-in-One, this device combines 3D printing with 3D scanning to allow you to copy existing objects. The scanned objects can be stored in the .das file format (ready for editing) or .slt (ready for printing). The da Vinci 1.0 AiO is expected to ship in Q4 2014 for under 800EUR.